Photo by Farm Hack licensed under CC BY 4.0. 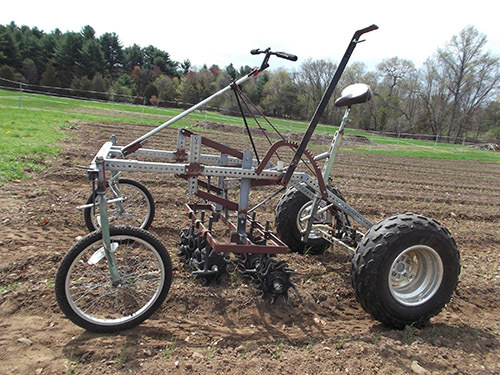 Part of the exhibition 'By the People: Designing a Better America,' the Farm Hack Tools' Culticycle is a pedal-powered tractor for cultivation and seeding. Built from readily available lawn tractor, all-terrain vehicle and bicycle parts, it is cheaper than motorized tractors, compacts the soil less and uses no fuel. FAYETTEVILLE, Ark. – The exhibition "By the People: Designing a Better America" will be on display through Dec. 16 in the Fred and Mary Smith Exhibition Gallery and other locations within Vol Walker Hall, on the University of Arkansas campus in Fayetteville. It was organized by Cooper Hewitt, Smithsonian Design Museum and is presented on campus by the Fay Jones School of Architecture and Design. This exhibition of "By the People" is the first to take place nationally outside Cooper Hewitt in New York. "By the People: Designing a Better America" is the third exhibition in Cooper Hewitt's series on socially responsible design. The first exhibition in the series to focus on conditions in the United States and its bordering countries, "By the People" will explore the challenges faced by urban, suburban and rural communities. Organized by Cynthia E. Smith, Cooper Hewitt's curator of socially responsible design, this touring exhibition features about 40 design projects from every region across the United States. Smith conducted more than two years of field research — traveling to shrinking post-industrial cities, sprawling metro regions, struggling rural towns, along border regions, areas impacted by natural and man-made disaster and places of persistent poverty — in search of collaborative designs for more equitable, inclusive and sustainable communities. The exhibition will highlight design solutions that expand access to education, food, health care and affordable housing; increase social and economic inclusion; offer improved alternative transportation options; and provide a balanced approach to land use between the built and natural environment. "As America's design museum, Cooper Hewitt empowers visitors to see themselves as designers — not just of objects, but also of ideas, strategies and solutions that improve our daily lives," said Caroline Baumann, Cooper Hewitt director. "'By the People' will showcase the innovative and impactful actions generated through design, and inspire creative problem-solving at local, regional, national and even international levels." On view in the Smith Exhibition Gallery and the main corridor of Vol Walker Hall, this exhibition will be divided into six themes: act, save, share, live, learn and make. To orient the visitor, the complexities of poverty, prosperity, innovation and design in the United States will be addressed in an introductory section that will feature a captivating video by Cassim Shepard, an interactive data visualization, "Mapping the Measure of America" and graphics that chart social and economic inequalities. Following is an overview of the exhibition's six themes: act, save, share, live, learn and make. Addressing entrenched environmental, economic and social issues, design can act as a catalyst for change. Featured work in the "act" section includes Cross-Border Community Station, bi-national Tijuana River watershed, which provides a platform for user-inspired problem-solving research joining science, education, design and community outreach. By building on existing assets — culture, natural and built environments - design can help save what is authentic and essential for communities to thrive. The projects on view in the "save" section include the Belt Line Atlanta Concept, a grassroots effort to save and transform four old rail lines into a 22-mile green loop that will connect 40 diverse neighborhoods with transit lines, walking trails, bike paths, parks and adjacent permanent affordable housing; and the LaSalle Cultural Corridor, which helps to preserve one of New Orleans' indigenous cultural art forms through the revitalization of a major street in the historically significant Central City neighborhood. The design of civic spaces helps under-represented communities and new voices share, both in the physical and digital commons. Works on view in the "share" section include Las Abuelitas Kinship Housing, an affordable housing community in Tucson, Ariz., designed for and by low-income grandparents raising grandchildren; and Farm Hack Tools, designed by an open-source community that nurtures the development, documentation and manufacture of farm tools and skill sharing for more resilient and sustainable agriculture. The "live" section focuses on improving access to healthcare, clean water and food. Among the works on view are Humane Borders Water Stations, a network of emergency water stations placed in known desert migration routes along the U.S. and Mexico border; Fresh Moves Mobile Markets, which transforms former city buses into mobile produce markets bringing fruits and vegetables to "food deserts" — communities with limited access to fresh produce — in underserved Chicago neighborhoods; and Firehouse Clinics in California's Alameda County that are located on the grounds of fire stations to provide a new accessible model of health care provision for the 65 million Americans who live in primary care shortage areas. Featured works in the "learn" section provide wider access to learning and knowledge to help build more resilient individuals, neighborhoods and regions. Projects on view include D.C. Neighborhood Libraries, local branches that have been renovated or rebuilt in Washington to create new civic spaces for numerous historically underserved neighborhoods; and Public Access 101: Downtown L.A., an initiative that mixes urban hikes, interactive field exercise and critical cartography and other interpretive tools to spark creative explorations of everyday habitats. Projects on view in the "make" section examine strategies to engage and develop creative and manufacturing industries. The exhibition will feature works such as RAPIDO Rapid Recovery Housing in Brownsville, Texas, which begins with a 400-square-foot core unit erected immediately after a natural disaster and home expansion designed in collaboration with returning families; Raleigh Denim Workshop, which enlisted the aid of master pattern makers, sewers and farmers from the surrounding area to craft classic American jeans with one of the smallest carbon footprints in the world; and Rebel Nell, a design initiative in Detroit that offers job training, life management and financial guidance for women transitioning out of homeless shelters. About Cooper Hewitt: Cooper Hewitt, founded in 1897, is the only museum in the United States devoted exclusively to historic and contemporary design. On Dec. 12, 2014, Cooper Hewitt reopened in the renovated and restored Carnegie Mansion in New York City, which offers 60 percent more exhibition space to showcase one of the most diverse and comprehensive collections of design works in existence. The renovation of the Carnegie Mansion and museum campus was recognized with LEED Silver certification. For more information, visit cooperhewitt.org. About Fay Jones School of Architecture and Design: The Fay Jones School of Architecture and Design at the University of Arkansas houses professional design programs of architecture, landscape architecture and interior design together with liberal studies programs. All of these programs combine studio design education with innovative teaching in history, theory, technology and urban design. A broad range of course offerings equips graduates with the knowledge and critical agility required to meet the challenges of designing for a changing world. Their training prepares students with critical frameworks for design thinking that also equip them to assume leadership roles in the profession and in their communities. The school's architecture program was ranked 26th in the nation, and the 12th best program among public, land-grant universities, in the 16th Annual Survey of America's Best Architecture and Design Schools, a study conducted in 2015 by the Design Futures Council and published in DesignIntelligence. For more information, visit fayjones.uark.edu.